MSNSW’s second Grape Escape weekend on 19 & 20 May 2018 was a great success. First in everyone’s mind was the opportunity to get coached by our crack roving coaching team of Anne Smyth, Caroline Makin, Paul Bailey and Di Coxon- Ellis. 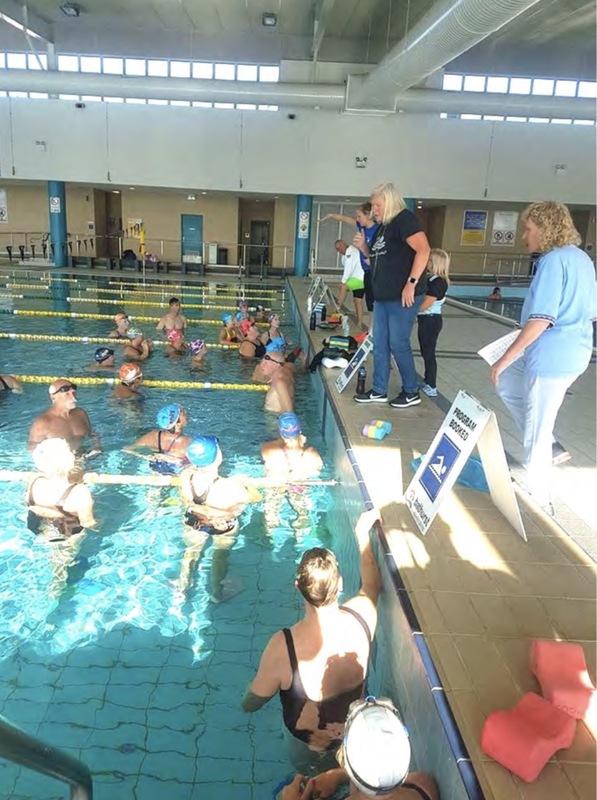 With over 30 eager swimmers in the water, including some very welcome local non-masters swimmers, the coaches managed to cover all four strokes, with drills and instruction on technique. The mini-meet on Sunday morning was fast, efficient and lots of fun, with a full complement of volunteer officials on deck as well. For some the highlight was the 10- person relay, with Manly suiting up gamely against all comers. Valiant, yes. This was a get-away weekend. Lunch, wine tastings and dinner were important to many swimmers while others just enjoyed being in the country with all the fresh appeal that late autumn offers. Thanks everyone for coming along and making it fun. Keep your eyes peeled for the next MSNSW grape escape weekend to . . . who knows where? Ryde Masters once again organised and invited our club to join their annual swim camp at Thredbo during 30 September – 3 October 2016. There was a mixture of first timers and regulars from Tuggeranong Vikings: Katrina Burges, Al Byrne, Leisa Cass, Denise Druitt, Atsuko McGowan, Kyle McLean (all the way from Geelong), Caroline Makin, Nicolee Martin, Elizabeth Needham, Anne Smyth and Marianne Tweedie. What a great way to spend the long weekend! No doubt we all wondered what we were doing driving into Kosciusko National Park with sleet and snow falling on the Friday … it was a relief not to have to put on snow chains. The weekend was full of wonderful views, hard work, relaxing, eating, sleeping and many tips. Some even found the energy to go for a walk, go up the chair lift, or ski. Swim sessions were spread across early mornings (7am to 9am Saturday, Sunday, Monday) and evenings (5pm to 6.30pm Friday, Saturday, Sunday) with a 1 hour core session on the Saturday and Sunday (4pm to 5pm). Our coaches Greg Lewin, Anne Smyth, Wendy Magnus, Leisa Cass and Caroline Makin provided us with lots of variety: technique, race strategies, tumble/open turns, diving, engaging twitch muscles, and drills. A great take away from the core sessions with Greg is the ‘spider splat’ an advanced plank … for those of us who can do it. I was on my knees! Anne imparted her race strategy secrets. The sessions were well spaced and varied being broken into two hard sessions: endurance (slow to fast twitch), and sprint on two separate days. In between these sessions focus was on stroke technique across freestyle, backstroke, butterfly, and breaststroke, turns and diving, so were less intense and allowed for some recovery. Coaches did a great job: memories of Lane 1 were: “I can’t do any more, What time is it, I need to fill up my water bottle, I need to go to the toilet, I am feeling tired, I have cramps, I am feeling dizzy, My snorkel keeps filling up with water, I have a sore shoulder, Can we just do 25 metres?”. Our coaches took it all in their stride. I am sure the other lanes didn’t employ our tactics! It is good staying at Boali Lodge as meals are ready after swim sessions with no need to think about where or what to eat. They cater for different food needs as well … and did I say that the views from the lounge are just wonderful! It also has free Wi-Fi. Monday morning put on another show of sleet in the Park for our return home. Monday morning stretch and swim was a freshen up from the hard work and the highlight was finishing off on the slide into a much warmer pool. It is a great way to spend the long weekend; body fatigue from exercise is a good feeling. It has been another successful year for the Tuggeranong Viking endurance swimmers, placing fifth in the National Endurance 1000 program and second in NSW, just behind Campbelltown. The club accumulated 12,165 points. Thank you to the 55 swimmers who participated at some time over the year and gained valuable points for the club. The club scored 126.72 points per average swimmer and this placed us 8th in NSW and 19th nationally. Congratulations to the five swimmers who completed the yearly program of 62 swims which range from 400m to hour-long swims and gained maximum points in all swims – Brenda Day, Katrina Burgess, Caroline Makin, Jon McRae, and Ann Reid. David Bale and Andrea Teunissen also successfully completed the program and all seven swimmers are now anxiously awaiting their embroidered towel. 1) The total kilometres swam by the Tuggeranong Viking endurance swimmers was 690.8km. 2) A total of 928 swims were completed and entered into the Australian Masters Portal by Jane Lindsay. What an achievement – A huge thank you to Jane for her data entry! 3) The club had a participation rate of 57.29% of members participating. The program continues this year and all club members are welcome to participate in as few or as many swims as each individual would like, adding to the Masters swimming motto of “fun, friendship and fitness”. More information about the club results and individual point scores of all participants is available. Endurance sessions are held on Tuesday morning at 1030hrs to 1200hrs and Saturday mornings from 1030hrs to 1230hrs.